See Derek Butcher notes below. ‘Dilemma’ by Julie Batty 11/16 T. purpurea 'Purple' Andrew Flower. In 1947 a plant from Marnier Lapostolle’s collection was given the name T. dianthoides var grisea with a vague description and which Lyman Smith considered a synonym of T. bergeri. What happened to the name on the label? Because the inflorescence looks more like a T. aeranthos it is reasonable, but not proven, that the plant was soon being grown in Europe as T. aeranthos grisea but with possible hybrid connections. 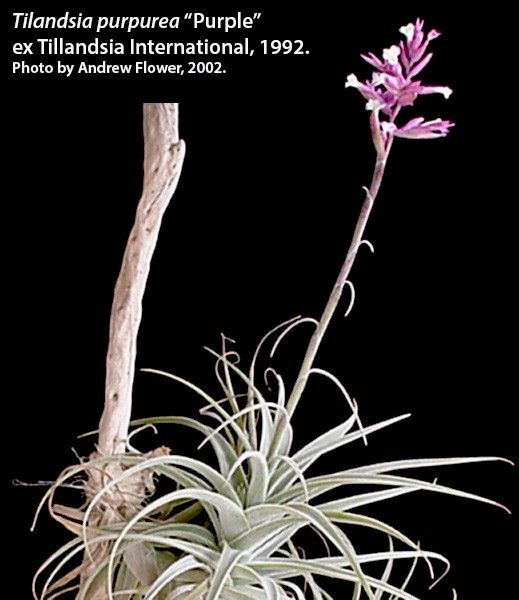 As we know, most Germans interested in Tillandsias at that time ignored recording anything that had not been found with wild provenance. This was no different to the American Bromeliad Society which in 1950 extolled hybridisation but set up no system to record such happenings. In Australia from the same vintage we had T. ‘Nez Misso’ which can be loosely described as a T. aeranthos with grey petals. We guess that it was seed sent from Europe with a likely suspect being Dr Oeser. In the 1970’s or thereabouts Joan White imported T. aeranthos grisea and this flourished in NSW and in 2000 I started checking this up but did not get very far other than linking it to ‘Nez Misso’. I even sent a piece to Eric Gouda who forced it to flower and it had blue flowers. 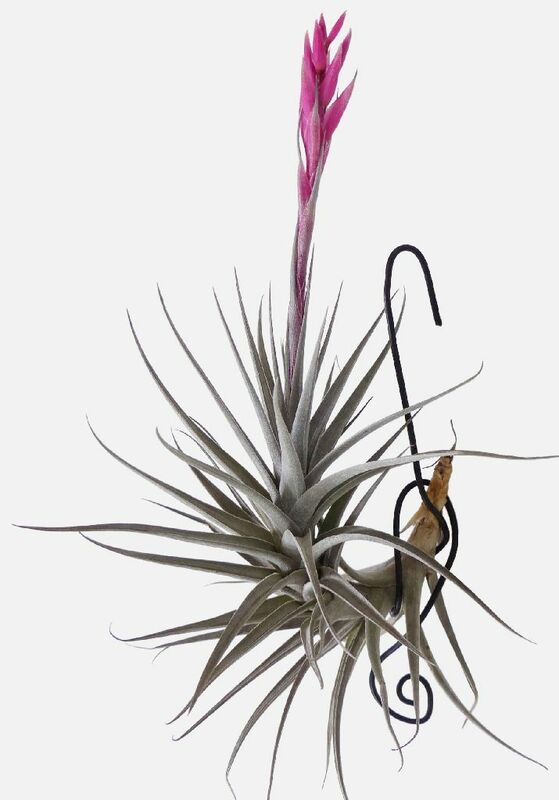 We kept the name T. ‘Aeranthos grisea’ although why the ‘grisea’ (grey) we did not know. 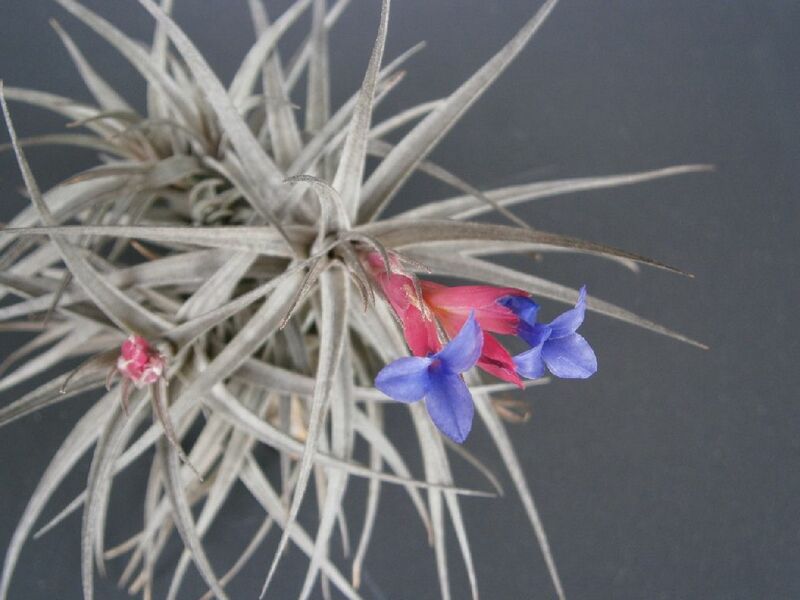 In the 1980’s Hiro Takizawa imported T. aeranthos grisea from Germany (see Tillandsia Handbook: 30. 1998). This shows even more variability. Could this be because it is a grex?! In 2004 in Australia we bumped into a plant called ‘Nez Misso’ but it had blue flowers so we registered it as ‘Confusion’. Dare I suggest that you compare the plant in the BCR with the name ‘Aeranthos Major’ being used in the USA. 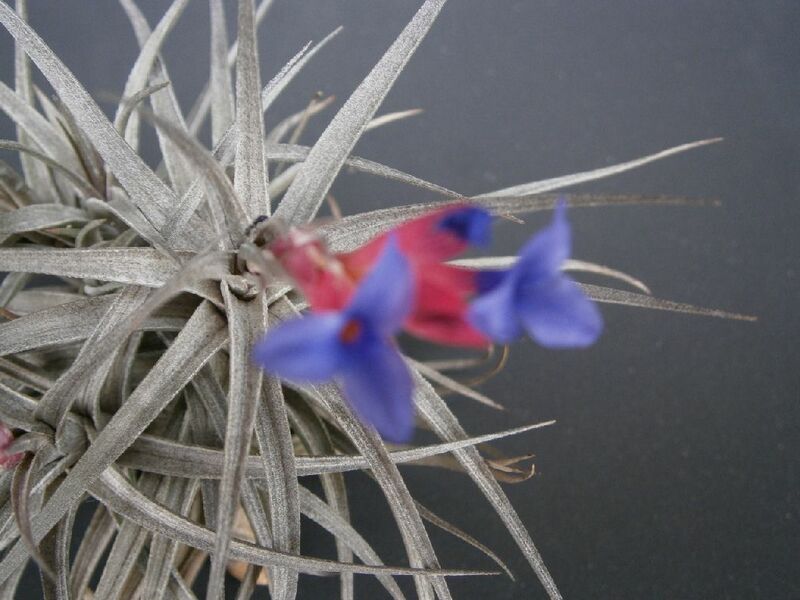 In the 1990’s Tillandsia International had a plant on offer as Tillandsia Purple Peru. It did not take long for this to be identified as T. purpurea. In fact, in 1992 it got to Andrew Flower at Anwyl Bromeliads in New Zealand who treated it as T. purpurea ‘Purple’. In this early period David Sheumack of Sydney imported plants from Tillandsia International and one was called Tillandsia purple Peru. David was not impressed but still has it in his collection. His comments were ‘very slow growing and has only flowered twice in the last couple of decades, inflorescence like a BIG aeranthos but petals are a rather uninteresting grey/blue and the bracts a pinky/grey as I remember. Size of the inflorescence was the catching part, colour was rather boring.’ Clearly David was not impressed with the plant but it is still surviving. What is intriguing with Adelaide growers is that over the years the name on the label became a formula ‘T. purpurea purple X unknown hybrid’ with variations. Without it having a registered name this detail could not be checked but easily changed. The problem here was that the plant has T. aeranthos attributes. This indicates that Tillandsia International had inadvertently got plants mixed up. The mysterious plant got to Adelaide but took years to flower and questions started to be asked. How did a plant called T. purpurea x ‘Purple’ look like a T. aeranthos with grey leaves? Is the actual plant still surviving in Tillandsia International after 25 years? Nobody has reported having imported a plant with such an odd name from Tillandsia International since David Sheumack did so. There is yet another twist in that Plant Oddities is offering this plant with such an odd name on their website, clearly not bothering to check its authenticity but is it the same as our ‘Dilemma’?. 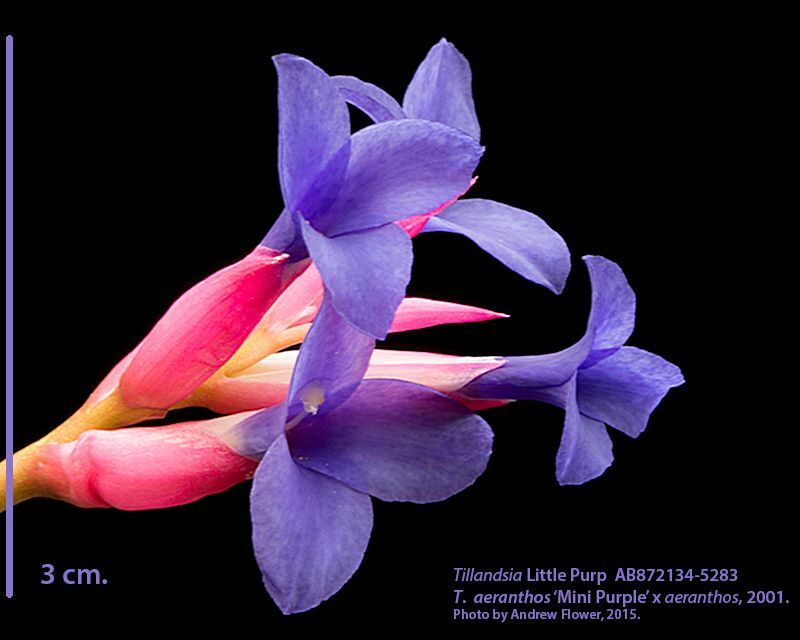 Even more intriguing is that Tillandsia International do not list ‘purpurea’ or ‘purple’ but do list aeranthos Purple Giant, aeranthos Purple Fan and aeranthos Mini Purple – all just nurseryman’s names or NN and we do not know where they differ from the type. Formulas should not be used either, to identify plants and the Bromeliad Cultivar Register is a way that such crosses can be given cultivar names and registered. This is why we will be registering ‘Dilemma’ with links to Adelaide and to T. aeranthos but parents unknown. If Tillandsia International and Plant Oddities can link their offerings to this registered name they are recommended to do so. Just one final comment. A few years ago in my quest to find out what was T. aeranthos grisea like in Europe I got a photo from Leo Dijkgraaf showing a T. aeranthos-like plant and flower. It went into my too hard basket. When I got Julie’s photo of flowering ‘Dilemma’ I sent it to Uwe Scharf ( a Lector for Die Bromelie). AND he said looks like ‘aeranthos grisea’ to me. As I said in my opening paragraph I believe this all started with a vague description in 1947. Too many variations on a theme! T. aeranthos 'Mini Purple', Ray Clark 11/16 T. 'Little Purp' Andrew Flower 11/16. Andrew Flower ... Re: T.Dilemma. I haven't seen scaly foliage like that on "straight" T. aeranthos here. Can't find my "Mini Purple" here at the moment, but from memory it is a bit smaller than usual. Won't be tempted into any blue vs purple debate. Anyway, here is a photo of a cross provisionally named "Little Purp." T. aeranthos 'Mini Purple' (ex T.I. 1992) x T. aeranthos ex Lotus Osiris, Brazil, 1969. Will have to wait until more seedlings flower and see if they are consistent - in which case I might register and sell it as an intra-specific hybrid grex - or if not will assume at least one of the parents is a hybrid and then I might select any individuals that are particularly nice and propagate them asexually.